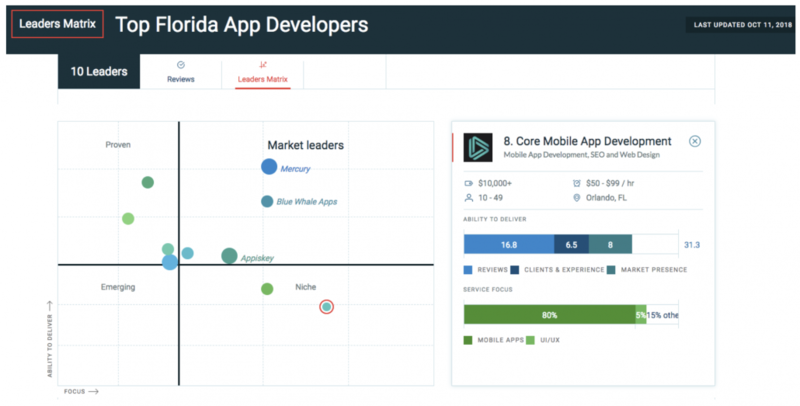 Core Mobile Apps Named Leader for Florida App Development! 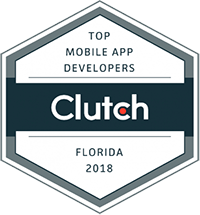 We’re thrilled to announce our inclusion in Clutch’s annual report of the best mobile app development companies in the United States! Among other Florida-based app developers, our team came in eighth alongside some worthy competition. An ever-evolving and volatile industry, app development is a competitive, challenging, yet rewarding space. While any company can get listed on Clutch, only the highest-performing and most reputable service providers are designated as leaders by means of verified client feedback and Clutch’s own internal scoring methodology. As some of our readers may know, Clutch is a B2B research, ratings and reviews platform based in Washington D.C, covering a vast array of IT and business services industries. Their goal is to facilitate productive and successful business relationships between the buyers and sellers visiting Clutch. In order to form their analysis, Clutch speaks one-one-one with a firm’s references, going in-depth concerning their project goals and results. Intertwined, Clutch incorporates a multi-faceted methodology taking into account factors such as a company’s market presence, industry acclaim, and clientele. They are thereby able to compile this data and form a Leaders Matrix of the best firms in a particular industry segment. 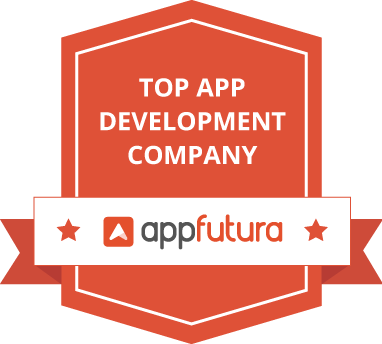 While it’s an extraordinary recognition of our team’s ability to be featured as one of the top mobile app developers in Florida, we want to take the time to thank our clients and those who have enabled us to reach great heights. Through their support, trust, and commitment to our vision, we’ve been able to produce some amazing work. 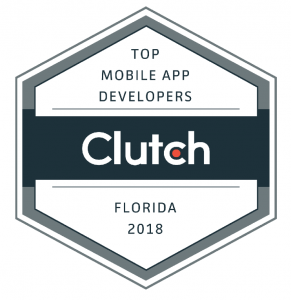 We were also named one of the top app development companies in Orlando by The Manifest, Clutch’s sister website that primarily focuses on industry news, guides, and company lists. We’re thrilled to be a featured company on both platforms. Thank you again to all our family, clients, and friends! Stay up-to-date with our Clutch profile here and don’t hesitate to reach out here to begin working with us on your next great idea. https://www.coremobileapps.com/wp-content/uploads/Screen-Shot-2018-10-17-at-2.33.39-PM.png 994 1956 Will Manuel https://www.coremobileapps.com/wp-content/uploads/3-300x71.png Will Manuel2018-10-17 18:35:222018-10-17 19:03:10Core Mobile Apps Named Leader for Florida App Development! There are more apps out there than ever before that are created to make life easier. There’s just one problem—there are too many to choose from! Although having more choices sounds better, having more choices is actually a bad thing. How are you supposed to know what kinds of apps will really make your life easier, and which ones are just a waste of time? Here are a few categories of apps that will actually make your life easier, and examples in each category for you to try. That way, you don’t have to download countless apps looking for the perfect ones. Money apps are a dime a dozen, no pun intended. The trick is to think about exactly what you want in an app, and only download apps that provide you with that service. After all, there’s no use in downloading an investment app if you aren’t serious about learning about investment strategies! If you regularly send money to Mexico, an app like Remitly would be a great choice because fees are low, and payments can be sent instantly. If you are looking for easy ways to save, an app like Acorns might be a good choice because it automatically rounds up purchases and puts the money into a savings account. Of course, a banking app is a must too, because it can help you keep track of your accounts on the go. You can find more than just your phone. Apps can help you find your car in the parking lot, lost keys, and more! Feeling bored? There’s an app for that! You just have to think about the kinds of activities you’re looking for. Stick with apps that focus on local events. One example is Eventbrite. It allows anyone to use the app to promote events and sell tickets, which means you’ll learn about more things going on besides big-name concerts. In addition, payments can be processed on the app, and tickets are downloaded virtually, so there’s nothing to print. Are you traveling and looking for things to do? Try Like a Local. This app will help you find fun spots to hang out and fun things to do. It’s even a great download for people who want to discover new things about the city they call home. Everyone gets sick from time to time. It’s such a pain to have to drag yourself into the clinic every time you develop a cough. It turns out you don’t have to, as long as you have the right app. Medical apps, like Doctor on Demand and First Opinion, allow you to speak with a medical professional from home. Some, like Doctor on Demand, require payment, while others, like First Opinion, are free. It’s not just medical doctors you can talk to. There are apps that can connect you with other health professionals too. DermatologistOnCall can connect you with a dermatologist, and Ginger.io can connect you with a coach who will help you overcome depression and anxiety. There are a lot of apps out there that can make life easier, but if you try no other ideas on this list, at least make sure you try a password manager. It is one type of app that everyone can benefit from. Worried that someone will hack into your account and get access to all of your passwords? Don’t be. Multifactor authentication is the norm with these apps, while others, like Keeper, take things one step further by utilizing fingerprint and facial recognition. Finding the right apps that will make your life easier can take some time, but the time they will save after you’ve found the right ones make the search well worth it. No matter which app you try, make sure you do your homework to ensure you’re getting all the features you want, without getting useless features you don’t. In this age when smart devices have been dominating the majority of the population’s screen time, developers have the responsibility and opportunity to further tap into this demand. Whether for business, study or day-to-day living, smart device users are booting up apps a lot of times per day. Developing an app follows the same formula as making a business plan. One of the first things you have to do is to formulate a concept that will cater to the needs or wants of a specific audience. Your market can be from age groups, professions, and interests. This helps you create a solid and well-rounded program. You can flesh it out based on your target market or your concept, whichever comes first. If you want to create a budget management app, think of a market that can benefit greatly from this idea. Entrepreneurs, homemakers and young professionals might fit into this category. Once you have a concept and a target market, you can start developing other aspects of the application such as features and interface. 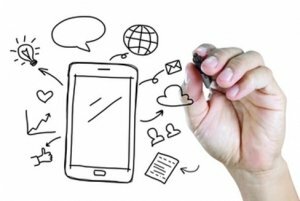 When developing an application, you want to make it accessible to a wider audience. However, one challenge users encounter with some apps is its lack of availability for the OS they use. There are some which you can use for Android but cannot be installed in iOS and vice versa. If you have to choose a specific OS, keep in mind that Android has a larger market share and more users as compared. Aside from the OS, you also want to make sure that not every customer has access to the internet at all times. Because of this, it is important to consider allowing offline use for your app. Customer support may also be a deciding factor, incorporate an efficient and effective assistance feature. Some believe that content is much more important than form. This line of thought holds function supreme over appearance. Whilst this can be true for others, it is always better to achieve a balance between these function and form. Remember, no matter how useful your application is, consumers might refrain from using your app if it looks tacky or off-putting. One way to increase the chances and duration of user engagement is to come up with a design that suits your concept and target market. You might want to look at the latest design and color trends. In the past years, Millennial Pink and Gen Z Yellow have taken different industries by storm. Homes items, clothes and even music videos are tinted with these two varieties of pigments. If you are targeting younger audiences, keep in mind that to members of these generations, the aforementioned colors are not merely hues; they also signify cultural and social expressions. This illustrates how aesthetics can affect the appeal of your app, so make sure to use these elements wisely. With progress and technology behind you, you are one step closer to creating an app that can boost your business and achieve your goals. By following these tips, you can ensure that your application will reach viral fame in no time.